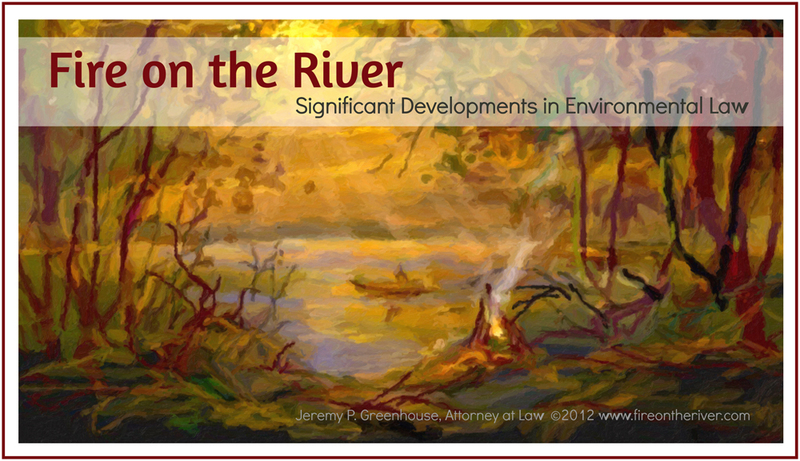 EPA Finalizes Carbon Air Emission Standards for Existing Power Plants | Fire on the River! On August 3, 2015, the U.S. Environmental Protection Agency (EPA) finalized the first-ever performance standards for carbon emissions from existing power plants in the United States under section 111(d) of the Clean Air Act. ____ Fed. Reg. ____. President Obama called the so-called “Clean Power Plan” “the single most important step America has ever taken in the fight against global climate change.” Whereas the proposed rule aimed to reduce carbon emissions from existing power plants by 30 percent compared to 2005 levels, the final rule is more ambitious, setting the goal at 32 percent. Under section 111 of the Act, performance standards for pollutants such as CO2 must be based upon the degree of emission limitation achievable through the application of the “best system of emission reduction” (BSER). In this case, EPA identified four broad “building blocks” that together constitute BSER for existing power plants: making plants more efficient, increasing the use of low-carbon power sources such as natural gas, using more low-carbon power sources (e.g., solar, wind), and increasing energy efficiency. On the basis of these BSER building blocks, the final rule establishes CO2 emission performance rates for two subcategories of affected electric generating units (EGUs)—fossil fuel-fired electric utility steam generating units and stationary combustion turbines. The rule then sets state-specific CO2 goals, expressed as both emission rates and as mass, that reflect the subcategory-specific CO2 emission performance rates and each state’s mix of affected EGUs subject to the two performance rates. States can determine the methods they will use to comply with the CO2 goals, which could include emissions credit trading between sources or even between states. Finally, the rule provides guidelines for the development, submittal and implementation of state plans that implement the BSER emission performance rates either through emission standards for affected EGUs, or through measures that achieve the equivalent, in aggregate, of those rates as defined and expressed in the form of the state goals. The final rule provides up to 15 years for full implementation of all emission reduction measures, with incremental steps for planning and then for demonstration of CO2 reductions, to ensure that progress is being made in achieving CO2 emission reductions. Concurrent with the final rules for existing power plants, the EPA also issued a final rule establishing CO2 emission standards of performance for new, modified, and reconstructed power plants. More information on both final rules, including the agency’s preamble (excerpts of which are included above), can be found on EPA’s website.